I just found out that Android, Goggle's mobile open source platform has been released. You can go to the Android site and check it out over there !! Ok so first things first: What is Android? Android is the first free, open source, and fully customizable mobile platform (remember, Open Source !!). But Android is not a single piece of hardware; it's a complete, end-to-end software platform that can be adapted to work on any number of hardware configurations. Everything is there, from the bootloader all the way up to the applications. And with an Android device already on the market, it has proven that it has what it takes to truly compete in the mobile arena. 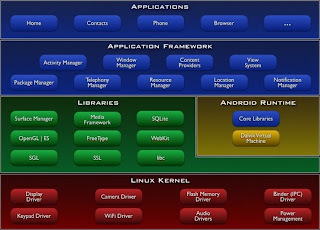 Android offers a full stack: an operating system, middleware, and key mobile applications. It also contains a rich set of APIs that allows third-party developers to develop great applications. So...which is the first Android mobile device? The T-Mobile G1 phone. Check out the T-Mobile page about this phone and play with it a little so you can see what the Android Platform is capable of. And let me share this article from Ars Technica giving you a quick overview about the phone and the platform. By the way, Android is an effort of Goggle and the Open Handset Alliance !! So, go ahead, check out the sites and read a little about the phone. In my opinion, since Android is an Open Source project that allows developers to contribute to the source code and give a lot of feedback, I truly believe is going to have a fast growth. Also, having one real mobile device already available in the market will make Android to win (or lose? we will see in the upcoming months) trust very quickly. Mobile application market is going to grow in the upcoming years. Whether you chose Android, Windows Mobile or Objective-C for IPhone development we will have a lot of room to develop applications in the mobile market.